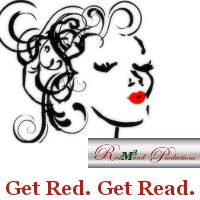 One of my personal muses is Red at Mommas Money Matters. She is funny, irreverent, brilliant and insightful and without doubt one of the great social commentators of our time. Today she posted http://mommasmoneymatters.com/sunshine-2/ a fun pick your own award challenge that I couldn’t resist. Not because I wanted an award, rather because I wanted the challenge (you’ll see). 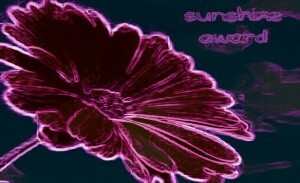 Red has changed the rules of the Sunshine Award. I liked her change and her challenge. I have taken it up; I will leave it for all of you to also accept, though I will pick a different challenge for you I think. The original Sunshine challenge includes ten questions. I am supposed to tell five secrets, both guess at five of Red’s previous answers to a previous award and finally write a one hundred word Flash Fiction using the word Sunshine. Because I want the big pretty award picture I am going to do all of this in just that order. I drove for 5 years without a driver’s license; I didn’t apply till I was 22. I am depressed (clinically) without sunlight. I’ve had gray hair since I was 17. I truly despise disingenuous people more than just about anything else. I have smoked for 45 years; no I don’t cough in the morning! Finally, Red asked that those of us who wanted to claim her pretty and intriguing new Sunshine award write a 100-word Flash Fiction, here is my entry. Pass the award on if you want or do what I and Red have done, off them up to be claimed. Claim Sunshine Award – Answer the 10 Questions. 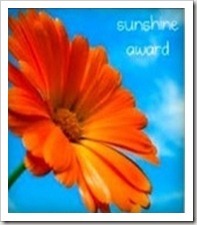 Claim Wendy’s Sunshine Award – Answer 10 Questions + 5 Secrets. 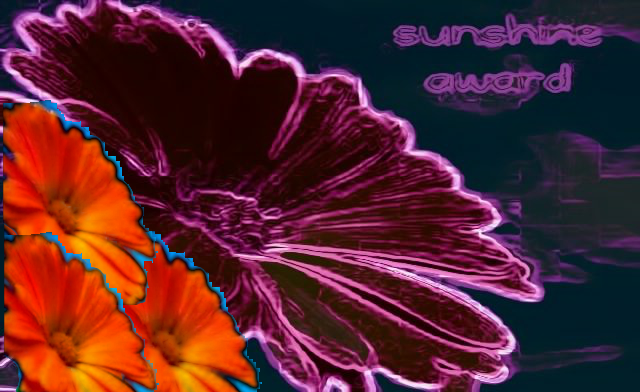 Claim Red’s Sunshine Award – Answer 10 Questions + 5 Secrets, Add your name to the Blog Roll, Write 100-word Flash Fiction using the word Sunshine. You know, you’re right. I have 5 awards that involve answering questions and picking nominees. I have another one that I’ll be posting later today. I think I’ve done enough, at least for a while. I do this periodically. It is simply easier, though I admit to being forgetful and lazy both when it comes to awards. The rain comes down and the skies are dark….I think I will have to consider writing something reflective of this, naughty? We shall see. I love snowballs (that don’t hit me). It is wonderful to meet you and I look forward to reading more, I poked my head in last night but was already starting to nod so though I would save more for today. Much applause and sparkly rain paper!! I love it 🙂 You deserve it!